The loss sees the Giants fall to 2-2 in the NFC Eastern division, behind Philadelphia (3-0) and Dallas (3-1). 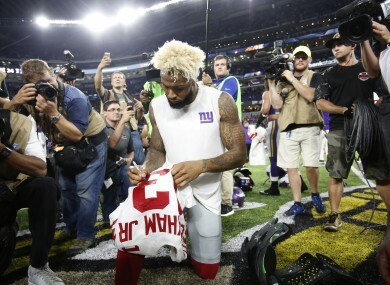 New York Giants wide receiver Odell Beckham autographs his jersey after an NFL football game against the Minnesota Vikings. THE MINNESOTA VIKINGS extended their unbeaten start to the season as another dominant defensive display earned a 24-10 win over the New York Giants on Monday. The Vikings defense left Giants star receiver Odell Beckham Jr a frustrated spectator for much of the contest and produced two turnovers that earned 10 points for the hosts. The loss sees the Giants fall to 2-2 in the NFC Eastern division, behind Philadelphia (3-0) and Dallas (3-1). The Vikings head the NFC North with a 100 percent record. The defeat also maintained Giants quarterback Eli Manning’s miserable run of form against the Vikings. Manning finished with a scratchy 25 completions from 45 attempts for 261 yards. Vikings cornerback Xavier Rhodes also picked a crucial interception against Manning in the third quarter. It was the 15th time in eight starts against the Vikings that Manning has been picked off. Manning is 2-6 against the Vikings. For Minnesota, Sam Bradford found Kyle Rudolph for a touchdown once again as Minnesota shrugged off the slew of injuries that threatened to ruin their season before it had even started. Star quarterback Teddy Bridgewater suffered a season-ending knee injury in pre-season while running back Adrian Peterson was also ruled out for the season after an injury in last month’s win over the Green Bay Packers. Minnesota’s other touchdowns came from Matt Asiata and Jerick McKinnon while Bradford finished with a respectable 26 for 36 for 262 yards. So far this season, the Vikings have conceded only 50 points in four games, the lowest points against tally in the league among teams who have played four. Email “Odell Beckham left frustrated as Vikings stay unbeaten”. Feedback on “Odell Beckham left frustrated as Vikings stay unbeaten”.